That was my first Akademy after a while, I've been following previous two with kids on my lap. I think Brno turned out to be both a pretty destination and decent host for all KDErs. I met many great old KDE friends. I had good time chatting with openSUSE's Bruno Friedmann, unbelievably dedicated to both the distro and KDE. I met the stars of the KDE Visual Design Group. Consumed a few quarters of time of Timothée Giet, well known Calligra and KDE contributor. Thanks for all inspirations! I mention these meetings as design has always been my special interest. Kexi BoF on early Monday, unfortunately my last day, was filled with clearing up ambiguities of Kexi's feature set and approach to creation of custom apps (yes, Kexi's destiny is to act as complete run-time and design tool for apps). Friedrich Kossebau, who helps with Kexi/Calligra a lot, largely contributed to this meeting. The BoF as and extended with always reliable Kevin Krammer and other friends. What are the KDE's products? That was a topic that circulated in the air and i suppose many contributors took it back to their homes. From my user-oriented optics gained over years, KDE produces apps and development frameworks, period. Give this optics, Plasma is an app, that people could freely install and remove these days, without doing too much harm to their app experience. People mix apps that fit best to their workflow given they have freedom to do so, many of us never close the browser, and never sign out of some services. Frameworks help with making the KDE apps easier to pick individually, to get even more "native" feeling on other environments, it's not enough to say it once :) Now times of Internet Explorer dragging everything (including Silverlight, three Java versions and Flash) with it to your home shall be over. It's enough that current browsers are fat, they are almost like a separate OS environments within your native OS. Here, someone could even say the KDE Frameworks is a byproduct... but a great one. Yesterday Kexi 2.8.6 has been released within Calligra. 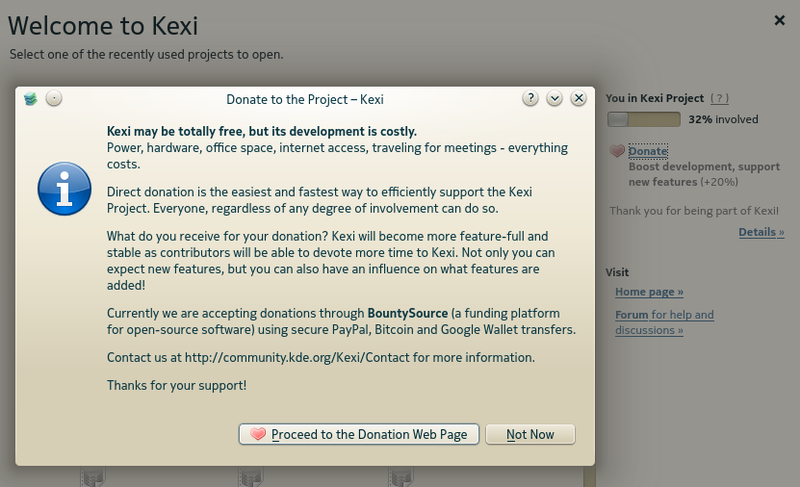 Click the link for a list of changes, and a mention of pretty unusual addition to Kexi - it proposes direct donations on its Welcome screen. It turned out to be convenient and hopefully not too annoying given what the benefits might be. It's best explained by the screen shot. We in the team are clearly happy with the number of fixes that appeared in 2.8.6. Now we're on the good way to the 2.9 series, the flow of commits has started already. A few new features are possible until the December release, one of them is a structure tree for Reports. Qt 5 and KDE Frameworks 5-based version of Kexi will be called 3.0, and its development is expected to happen in parallel with 2.9 development and maintenance, so it all starts now to meet the "early 2015" deadline. I plan to share major news from this front on this blog. OT: What font is that? it's awesome to see such improvements on Kexi and Krita, but I'm wondering since a long time: what about the other projects in Calligra suite? Karbon14 for example, seems it is in the same state as it was two years ago.. Am I wrong? Correct, Calligra is looking for many more contributors and we need maintainers for Karbon and Plan apps.